As I promised, I’m posting two wonderful pictures from a wedding day sent by someone I know to add to our collections on Alaari, one of the three classic Yorubaaso oke or ofi, which I recently had occasion to point out is a generic name – like aso oke – for all hand-woven Yoruba textiles. Aso is Yoruba word for “cloth” and “clothes” while oke, which, in its most straightforward or basic translation means “up” but when paired with aso means “loom”, a common sight in maany homes of the past. Back in the 50s in my native Ondo State hometown of Iju in Akure North Local Government, I knew homes, including ours, where there were looms. Women in the village spun threads from cotton yarn and, rarely, from the silk cocoons, yes, really. These were the threads from which by hand-woven cloths were made. Those older than me actually wore school uniforms made from hand-woven cloths which were the most common fabric of the era. This is one of a variety of Alaari designs colors of which are greens and yellows as well as the basic red and cream/khaki/off white. 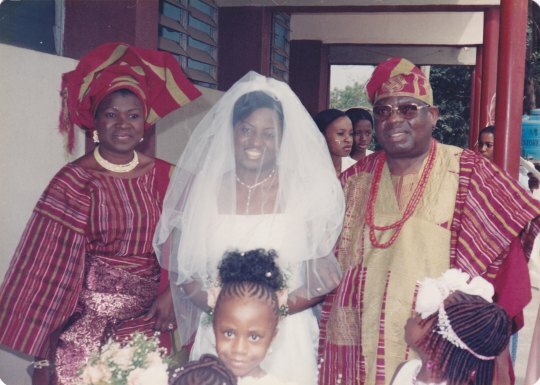 The mother’s gele – head wrap, and the father’s fila – cap – are not really Alaari but regular woven modern design that has complementary colars to the couple’s Alaari. Such mixes and matches are now quite common and add beautiful variations to aso oke, classic or modern. The bride’s mother wears pearls while the father stays traditional, topping his huge outfit with two strands of coral beads. Such is common for men at formal occasions like weddings, funeral ceremonies of OLDER family members. The Little Bride and flower girls wear corn rows! Bride's parents during the Wedding Service. This subject remains permanently open and from time to time, I will post new pictures. They may be from personal collection because I often use aso oke as shawls to dress up Western outfits. They could also be from others’ collections, especially old pictures. I thank the many readers who have viewed and read the various pictures on Sanyan, Etu and Alaari these past few weeks and I look forward to comments and/or additions that others can benefit from. The clothes have generated unprecedented readership numbers to this Blog. Readers should remember that mine is not an academic work even though the contributions by great scholars: Ulli Beier, Roland Abiodun and John Pemberton III got me going. As a reader, Mr. Ajipeya wrote a couple of weeks ago, serious researchers need to take up from where these tentative steps of mine end so that future generations could understand, for example as he suggested, the historical links between, say, the Nupes, Junkum and Idomas of Central Nigeria AND Yoruba of Southwestern Nigeria; the black classic, Etu as well as other patterns of aso oke, especially beautiful black and white mixes, are traditional to these ethnic groups.